The Shambhala teachings emphasize the inherent to awaken in every situation or potential mental state. Through discipline, kindness and sense of humor, practitioners are invited to explore and drop inflictive emotions and habitual patterns and awakening in this our nature of wisdom and compassion moment. Samatha meditation (calm stabilize), also called Pay Attention – Realize, is the basis of all the practices and teachings of our Meditation Center. This ancient practice of exploration and knowledge of one’s mind is based on a simple and revolutionary premise that every human being has the ability to cultivate stability, clarity and strength inherent in the human mind, so, develop compassion and wisdom necessary to care for oneself, society and the natural world. Instruction is offered for initial meditation instruction to all persons interested in learning to meditate. 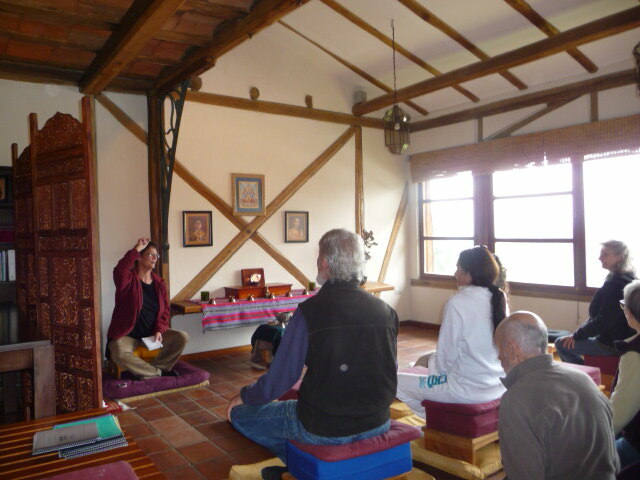 Shambhala Cuenca has members qualified to give personal instruction in meditation. Click here for contact information. This instruction is free. However, a small contribution is welcome and helps us to keep the space open to the entire community. Your generous contribution is integral to afford basic services, program planning, support of activities and projects, and a series of other initiatives that allow us to meet the Vision of Shambhala in the modern world based on the confidence of human dignity.